by Rev. Kristina Lizardy-Hajbi, Ph.D.
As U.S. culture and society have shifted over the last several decades, congregations have responded to these larger shifts in various ways. Many congregations have resisted these changes or have rejected them altogether, others have adapted in some ways but not in others, and still others have embraced these changes wholeheartedly. In any case, a congregation’s ability to change or adapt has become an important factor in recent years that requires deeper investigation. How are congregations doing in terms of change / have they made change in recent years? What factors were important in making the change or hindered the ability to change? 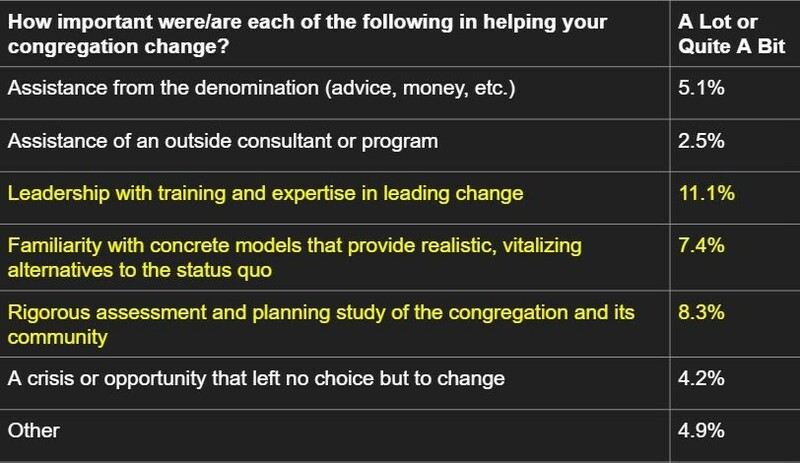 Of the 4,436 congregations that participated in the survey, 1,260 (30.3%) stated that they were “doing pretty well making the necessary changes” or “pride[d] [them]selves on [their] embrace of—and success in—constantly changing to improve and adapt.” For these “high change” congregations, roughly one in ten (11.1%) indicated that leadership with training and expertise in leading change helped their congregation change “quite a bit” or “a lot.” This was the most significant factor, followed by rigorous assessment and planning study of the congregation and its community (8.3%) and familiarity with concrete models that provide realistic, vitalizing alternatives to the status quo (7.4%). Interestingly, only 5.1% of high change congregations indicated that assistance from the denomination (advice, money, etc.) helped them to change. 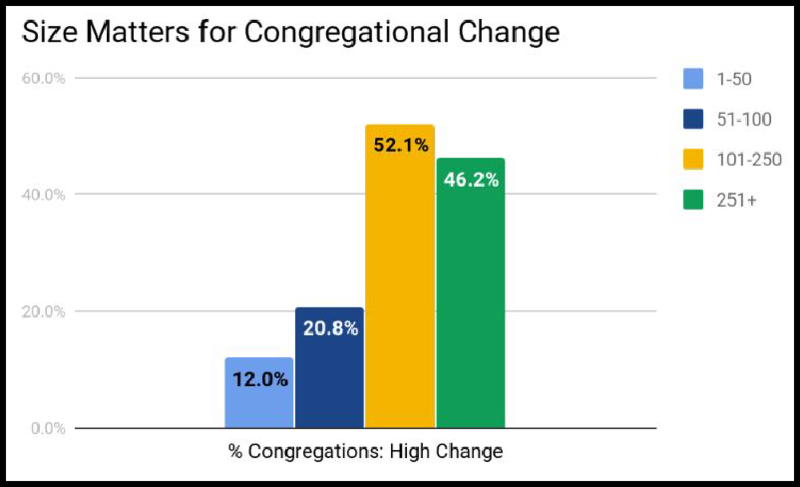 While these results provide some clues as to what factors are most helpful for congregational change, none of the survey options provided were selected as being the singular significant factor for the changes they made. When asked what other factors helped them to change, no factors were named frequently enough by respondents to be of general significance. At least for now, there seems to be no single factor that congregations can identify as being the catalyst for their ability to change; rather, there is likely a combination of several factors—both named and unnamed—that assist congregations in making changes. 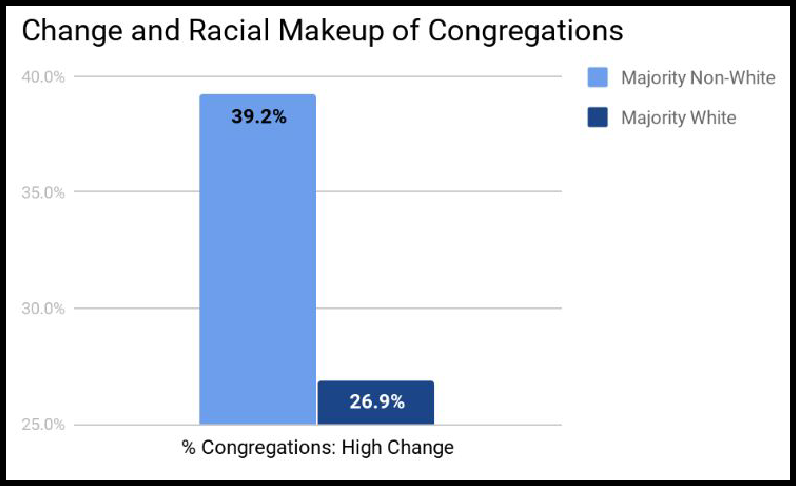 Interestingly, high change congregations indicated with greater frequency that a lack of resources, particularly of energy and finances, made it more difficult for them to change (21.5%). This was followed by strong resistance from some members (9.1%) and a lack of unifying or energizing vision or direction (8.9%). In addition, nearly two in ten respondents (18.1%) articulated a number of other factors that made it difficult for them to change, including aging membership and community, location (rural or in a seasonal population area), other demographic changes (immigration, ethnicity, industry, etc. ), denominational issues, and staffing challenges. Nevertheless, these congregations still articulated that they had made the necessary changes; so it is encouraging that they did not let these challenges hinder the change process altogether. Often, a congregation’s willingness and ability to change can also be a signal of the increased/ decreased presence of other characteristics. 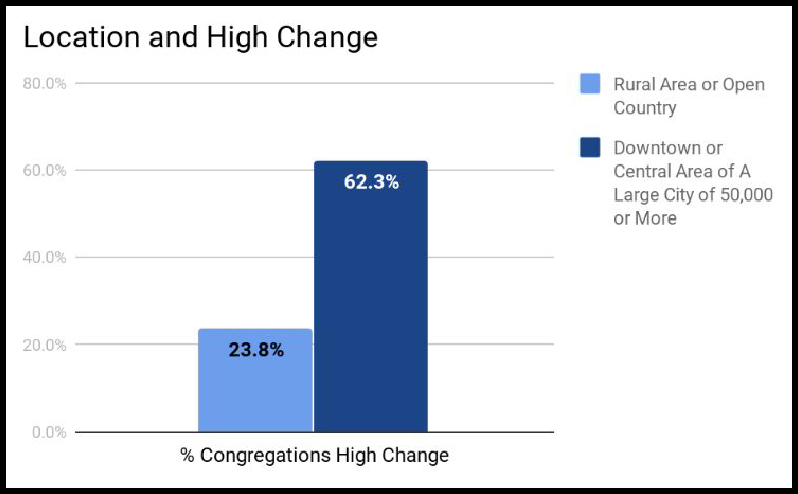 High change congregations are more likely to be located in a downtown or central area of a large city of 50,000 or more, be non-majority white in terms of membership, have a larger membership (with larger budgets and a senior leader/pastor with one or more associates), and have grown in the last five years. 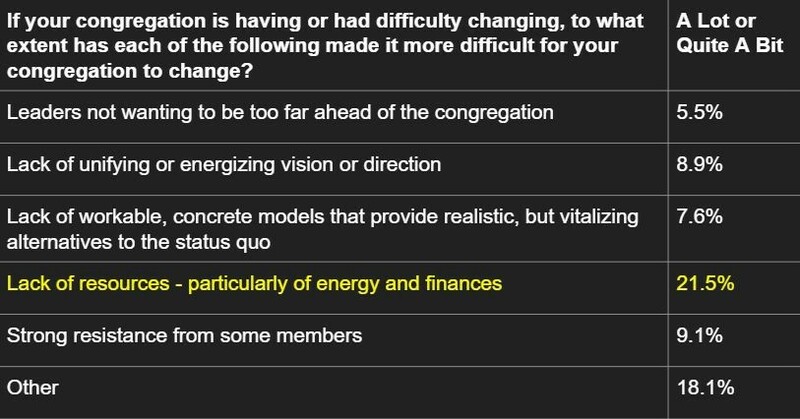 Also, these congregations overwhelmingly indicated that they have changed their worship style a lot, which could perhaps be the main reason why they indicated more generally in the first place that they have made/are making the necessary changes (though further research is needed in this area regarding what they mean by “change”). Furthermore, high change was significantly correlated with other characteristics such as being spiritually vital and alive, willing to change to meet new challenges, and intentional about maximizing the number and variety of small groups offered. 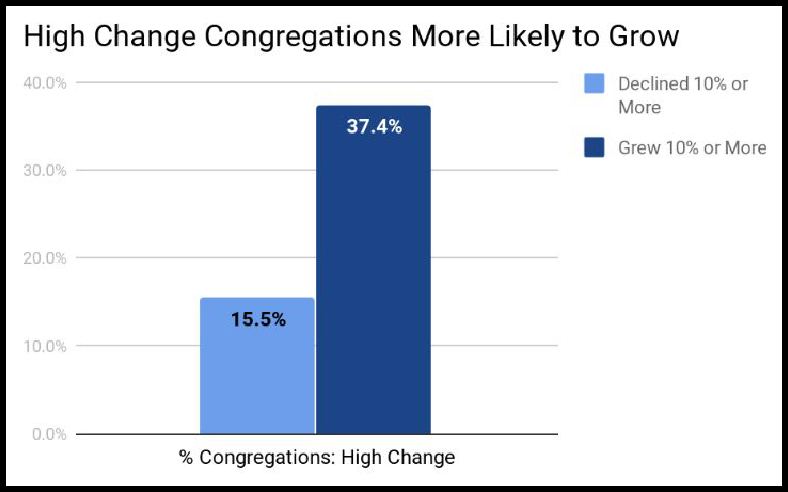 High change congregations also had primary leaders/pastors who were younger (high change average age = 53.3 versus no/slow change average age = 57.1), less likely to have conflict, and more optimistic about the future of their congregations than no/slow change congregations. Strikingly, these factors were also present in vital congregations; so it appears that the ability to change may perhaps be a predictor of vitality or, at the least, a significant correlate. Further analysis of the data may indicate other important findings regarding a congregation’s ability to navigate change, particularly as it relates to the theological perspective of a majority of members, use of electronic technology, and types of congregational activities. Regardless, the role of change in a congregation’s abilities to thrive cannot be underestimated; yet there is much more to be learned regarding the nature of, and factors for, these changes.